Maybe THIS is a Movie. 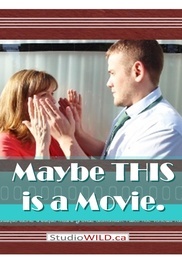 "Maybe THIS is a Movie" starring acclaimed Canadian actor, Donna-Lynne Larson, and newcomer, Ryan Price. This film is inspired by real life events. Featuring the unlikely pairing of a young gay male waiter /actor-wannabe and a middle-aged former actress/teacher, this poetic story explores many of the most relevant topics globally: Connection, Understanding, and Acceptance--and reveals that perhaps this desire for CHANGE everyone is talking about happens not by group force or protest against the illusion called 'them' but through 'one real and courageous connection at a time.' To be savored like a delicate, flavorful piece of pie, 'Maybe THIS is a Movie' slices into the sweet and tender layers we reveal when we 'open a door' and discover ALL that awaits us.